"We the people of the United States"-so began the American Constitution of 1787. Within a few years, this young country, made up mainly of eastern seaboard states, suddenly became part of a continent. A century later, its citizens would see themselves as defining the entire continent: "We are America." All this did not come about solely because of Lewis and Clark, or even Thomas Jefferson who commissioned the expedition-but it began with them. 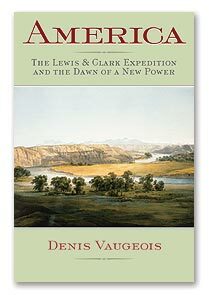 The Lewis and Clark Expedition and the men and women connected with it, as well as the geopolitical issues involved, constitute the lens through which historian Denis Vaugeois focuses on what typified the new nation's formative period, 1803-1853. He writes not only of the principal actors in this continent-wide drama, but of the humble or obscure people, and the Native Americans without whom the expedition wouldn't have succeeded. Informative, engaging, and eminently readable, this book recreates the world of the Lewis and Clark Expedition. It is amply illustrated with reproductions of carefully researched prints, drawings of people and places, maps, photographs, portraits, coins, and medallions. Denis Vaugeois is the author of The Last French and Indian War.Jane Brierley's translations include a number of books involving the North American past. Her most recent translation is Memoirs of a Less Travelled Road, the autobiography of eminent Canadian historian Marcel Trudel. 255 pp 9" x 6.75"